Last week saw the news that my friend — and co-founder of Home Etc — Jess, will be stepping down from hosting. Next Wednesday will be her last official day. It’s sad but totally understandable. Jess has taken on such a lot of social media work over the past few months plus her blog is more fashion focussed these days too. She won’t be too far away though and will still also be linking up periodically! Home Etc will continue to be hosted by myself and the lovely Lins from Boo and Maddie, on rotation. Last week we had some gorgeous blogs linking in. 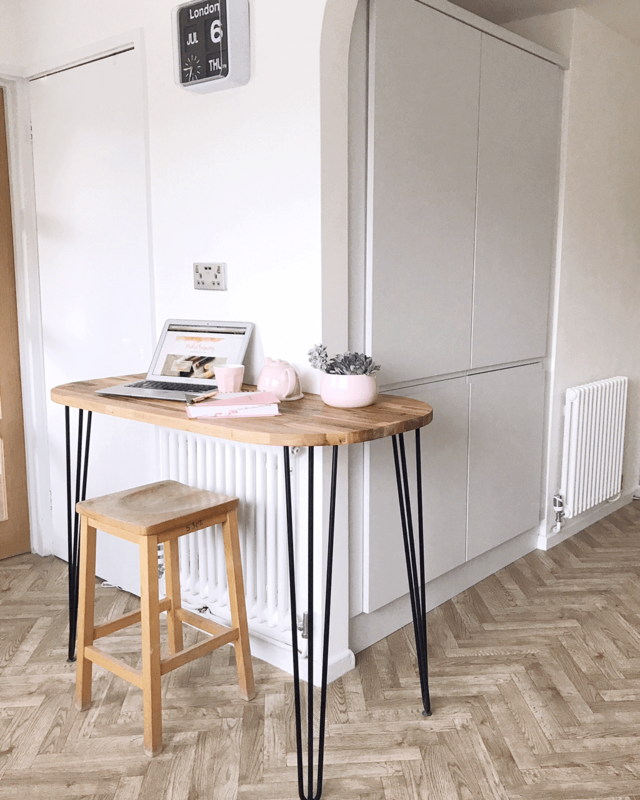 Special mention to Becky at Pinks Charming who shared a brilliant tutorial on how to create a fantastic breakfast bar using stylish hairpin legs that she’d sourced online. Such a cool idea. I love mid-century furniture and this modern take on the classic designs is genius! Second favourite came from Kara who blogs over at Innocent Charms Chats. Her post on the merits of peach interiors made me smile. As a fifteen year old with very strong ideas on interior design, my bedroom was a vision in peach and silver. It’s definitely not my favourite colour these days but I can totally see why Kara loves it so much. 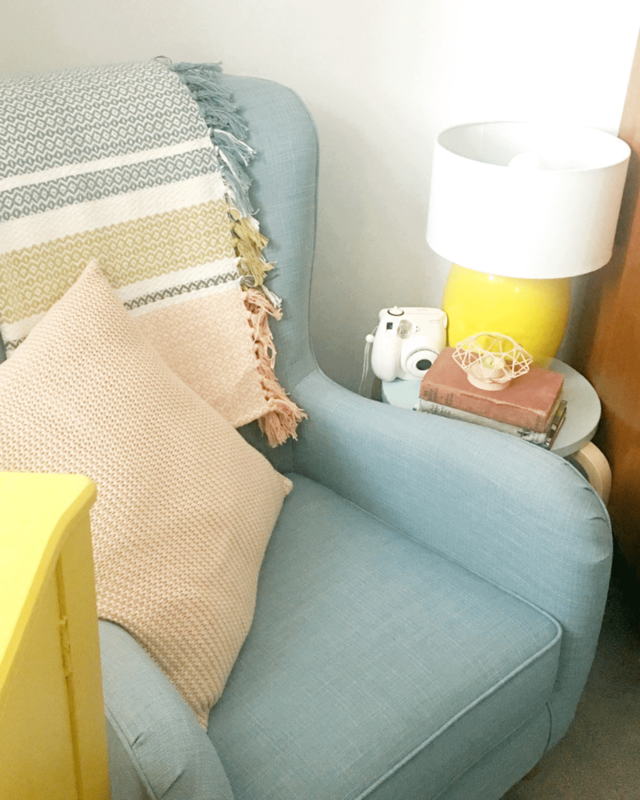 I might not be a card-carrying fan of apricot tones any more but I absolutely love how Kara has paired her peach throw and cushion with the zesty yellow and duck-egg blue. Such a gorgeous combination. Congratulations Becky and Kara — you’re both now in the running to win this month’s voucher from our fabulous sponsor, Laura Ashley. For anyone wishing to share posts in this week’s linky, have a little read of our house rules. As Lins and I will be sharing hosting duties now, just one favourite post will be chosen each week. Then at the end of the month we’ll choose an overall winner. This lucky blogger will receive a £20 voucher from our fabulous sponsor! Thanks so much for linking up all your fabulous posts. I look forward to reading more of the same this week! I am loving those pastel tones together and like you, probably wouldn’t have thought about it these days. I tend to go for stronger colours. My teenage daughter wants a navy blue feature wall in her room with dusky pink for the other walls. Watch this space!